What do you think about this sign? Took it with my iphone snug inside my car on the public street. Given all that has happened in our country in the last few months — the Boston Marathon bombing, the Kaufmann County murders, and three women being kept prisoner in a Cleveland man’s home for ten years… in my opinion, this may not be the best way to play Welcome Wagon. Then again, this is the wild, wild west! 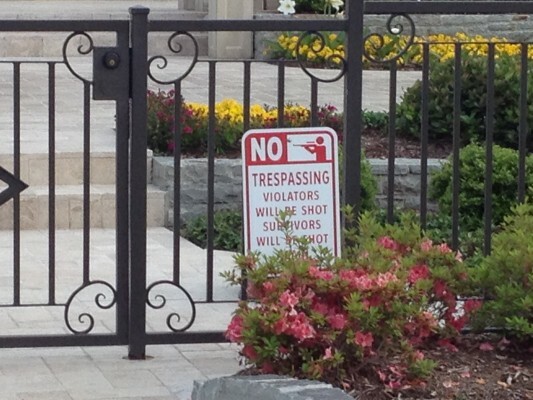 Talk About a Sign of Friendly Neighbors: "No Trespassing: Violators Will Be Shot, Survivors Will Be Shot Again!"